Last week, I talked about all the British setbacks in 1756. Sadly, Britain was in for more setbacks and turmoil in 1757. Much of this had to do with continued political chaos in London. It also resulted from the lack of a properly supported military strategy for North America. British military commander of North America Lord Loudoun grew increasingly frustrated not only with colonial politics, with his subordinate officers badmouthing him to friends in London, but also because London wanted to second guess his strategic command decisions. Loudoun planned to use his regulars to reinforce the frontier, from Pennsylvania to South Carolina and recapture lost territory. In early 1757, newly appointed Secretary of State William Pitt, who I am going to discuss in more detail in a few minutes, sent instructions that he should focus on Canada, taking Louisbourg and proceed up the St. Lawrence River to take Quebec. To help him with this task, Loudoun received another 8000 regulars. 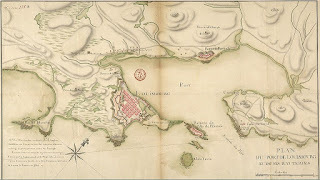 In early June 1757, Loudoun took 6000 soldiers to Halifax to besiege the French Fort at Louisbourg, along with additional support from the Royal Navy. the same path as Amherst did in 1758 shown on map. Although Loudoun felt this plan opened up New York, and the middle colonies to French attack, he was a good enough officer to follow orders. At this point, the frustrated Loudoun was probably happy to let the colonies suffer. He was sick and tired of dealing with provincials and their political leaders, who seemed to want to thwart him at every turn. In addition to the ongoing disputes over the quartering of his soldiers, the colonists continually refused to provide the necessary men and money needed to fight. His attempts to integrate colonial troops into regular units met with great resistance. At the beginning of summer 1757, in an attempt to prevent colonials trading with the enemy, he banned all non-military shipping. This led to huge economic disruption as no colony could get goods to market or receive imports. By June, colonial governors were countermanding his orders and permitting civilian trade ships to get back to their commerce. When he left for Canada with Gen. Abercromby and 6000 regulars, Loudoun was probably happy to leave Gen. Webb, in charge of frontier defenses. Webb, despite his own apparent cowardice, still had good friends in London and was one of the officers badmouthing Loudoun as a poor commander. Loudoun regarded Webb as timid and incompetent with friends in high places. Webb would be responsible for the mess and the colonials would learn that they needed to defer to a strong military commander with the necessary resources to defend them. Loudoun, however, also disappointed the ministry in Canada. 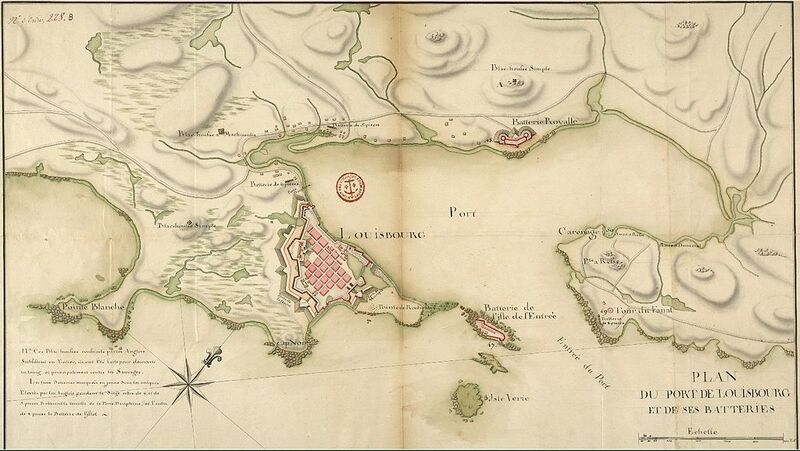 Pitt had wanted Loudoun to attack the French fort at Louisbourg. Even so, the French Navy in Louisbourg Harbor was too large for the small British fleet to challenge. With that, Loudoun gave up on Louisbourg and returned his forces to New York. There, he returned to his original plan of taking Fort Carillon at Ticonderoga. Even then Loudoun could not catch a break. A hurricane destroyed much of the British fleet on the return trip from Halifax in September. Meanwhile, during the summer of 1757, Gen. Daniel Webb led British forces in New York, attempting to make some progress there. Fort William Henry sat at the southern tip of Lake George in New York, the northernmost fort in a string of forts. As the Fort closest to the French lines, the British planned to use it as a launching point against French Forts Carillon and Saint Frédéric further up the lake. The French commander Montcalm thought it could be the next British domino to fall before the advance of the French and Indians. 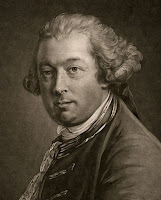 British Major William Eyre commanded the Fort during a surprise raid by the French over the winter of 1756. The French had not brought cannon, but had attempted to use the element of surprise to scale the walls and take the Fort. The British had beaten off this raid, but not before the French burned all the outbuildings and gunships. As the 1757 fighting season began that spring, the Fort remained in a precarious position. The garrison sat in an area surrounded by hostile Indians, meaning that the British got little intelligence. Without a ship, they could not even scout from the lake. The commander had relied on the highly effective Capt. Robert Rogers, of Rogers Rangers, to provide intelligence. The Rangers, however, had suffered heavy casualties during a scouting expedition and Rogers himself was convalescing in Albany. This left Eyre with little intelligence on enemy movements. Fort Edward was a few miles away, with reinforcements that could help to lift any siege. Otherwise though, Fort William Henry was a sitting duck. Montcalm prepared for an all out siege on the Fort in the spring of 1757. He had 6000 regular troops along with the necessary siege artillery. Despite his reluctance to use Indians after the Oswego incident, more than 2000 Indians showed up in the spring to participate in fighting against the British. Many of them had heard stories of the booty that others had collected in fighting during the year prior, as well as the ransom money Montcalm had paid to recover the prisoners taken at Fort Oswego. They wanted in on the action. Montcalm could not simply send them home without insulting them. Like it or not, they would be a part of the coming campaign. The British were preparing for the summer fighting season as well. 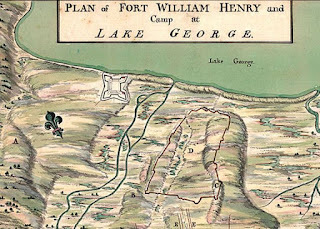 Lt. Col. George Monro brought five companies of regulars and about 1000 militia from New York, New Jersey and New Hampshire to Fort William Henry. Despite the difficulty with intelligence, by June Monro was aware that the French were assembling a force to attack the Fort. Monro sent 500 men in small boats on a raiding party up Lake George to destroy some French sawmills. The men ran smack into the main French force who killed or captured most of them. When word of the attack on the raiding party reached Fort William Henry, Gen. Webb, normally at nearby Fort Edward was at William Henry on an inspection tour. Webb immediately got out of there and ran back to Fort Edward, promising to send reinforcements. He ordered the regulars to man the Fort. The militia would encamp on a nearby hill in order to prevent the French from mounting cannon there. 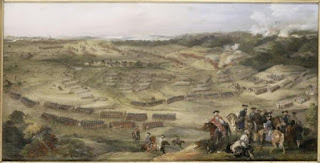 Monro only had about 1100 men fit for duty, facing the 8000 man French force bearing down on him. After returning to Fort Edward, Webb sent another 200 regulars and 800 militia as a relief force. He had more reinforcements to send, but did not want to make Fort Edward vulnerable. He also decided not to lead the relief force himself, but sent Lt. Col. Joseph Frye to take charge. Having more than 2000 defenders at the Fort created its own problems. The fort itself was designed to handle about 500 defenders. Most of the defenders had to dig entrenchments outside the Fort walls to build a larger defensive line. By early August, Indian snipers were firing on the Fort while French began entrenching siege cannon. Monro sent numerous letters to Webb calling for more reinforcements. Webb received these, but decided to leave Monro on his own. He was more concerned about the French taking the Fort and then advancing on Fort Edward. He refused to send more of his own troops until he received more reinforcements himself. As a result, it quickly became inevitable that the Fort would fall to the French. Monro engaged in a spirited defense for several days while the French artillery (actually English artillery the French had captured at Oswego) slowly reduced the walls of Fort William Henry along with the men inside. On August 9, Monro asked for terms of surrender. This time, Montcalm thought the British commander had acted nobly. He offered honorable terms, allowing the troops to retain their arms, possessions, colors and a single cannon. They would be given safe passage back to Fort Edward, and exchanged for the French prisoners held there. Once again though, Montcalm’s Indian allies were not on board with the plan. They had come to fight for booty and honors of war. 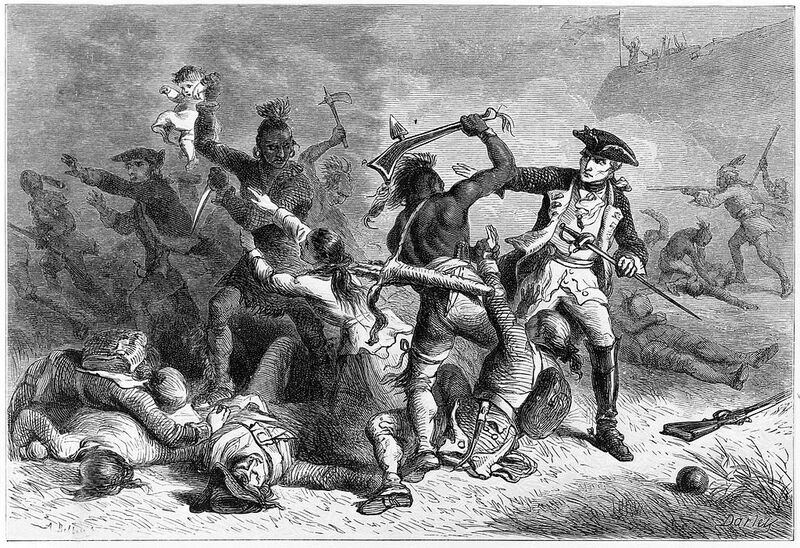 Once the British had turned over the Fort, the Indians assaulted the hospital, killing and scalping the sick and wounded. Next, they turned on the prisoners, stealing their possessions and taking many more prisoner, with the intention of returning home with them as slaves, or receiving ransom payment from Montcalm for their return. With more Indians present than the year before at Fort Oswego, the number of atrocities against prisoners increased greatly as well. Some stories at the time said that the Indians killed more than 1000 defenders. In truth the number was probably closer to 200. When the killing started, many prisoners simply ran into the woods, figuring they would take their chances rather than wait and be slaughtered. The Indians chased them down and killed some. But most escaped. Some survivors made it back to Fort Edward with shocking tales of the Massacre of Fort William Henry. Montcalm also recaptured several hundred of the prisoners and kept his promise to get them to Fort Edward. But the tales of the massacre served as a rallying cry for the British, one that would inevitably result in future revenge. In later battles, losing French forces would often be denied the honors of war in retaliation for this massacre. The situation also created a serious breach between the French and their Indian allies. 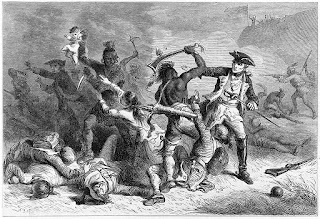 The Indians did not want to fight if they could not raid the forts and take prisoners, and the French did not want Indians who would not obey orders. The Indians left the theater to return home, unsure if they would ever return. Many left with prisoners in tow. This turned out to be a terrible mistake. Many of the prisoners turned out to be infected with smallpox. An epidemic spread throughout many of the French allied tribes. The number of Indians who died from smallpox as a result dwarfed the number of prisoners killed at the massacre. Without his Indian allies, Montcalm opted not to attack Fort Edward, which he probably could have taken from the trembling Webb with little effort beyond walking up to the Fort and shouting “boo”. 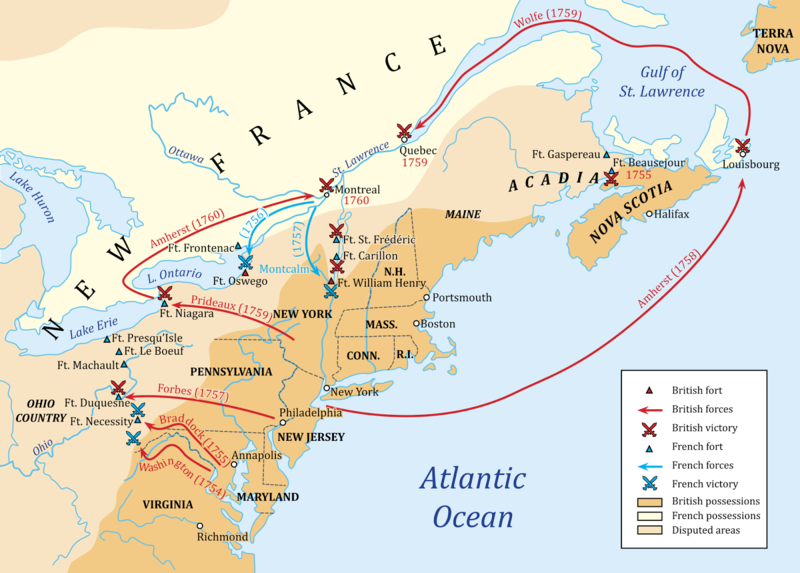 Instead, he burned Fort William Henry and returned to Fort Carillon, taking complete control of Lake George for France. Thousands of militia turned up at Fort Edward, in response to Webb’s calls for reinforcements. They were eager to exact revenge on the French for the massacre. But Webb had no intention of leading a counter-assault. He sent most of the militia home. Another year of fighting had brought no British success, as the 1757 fighting season came to an end. Despite French success in New York, the colonies continued to resist Gen. Loudoun’s attempts to reorganize colonial defenses. The arguments all remained the same. New England colonies did not want to raise taxes to send troops to defend New York. Colonial soldiers did not want to fight for the low pay being offered. Colonies did not want to pay to house Regulars. Colonial officers did not want to take orders from lower officers in the Regular Army. Colonial militia did not want to be subject to regular army punishments and discipline. Colonial resistance though, moved beyond grumbling. 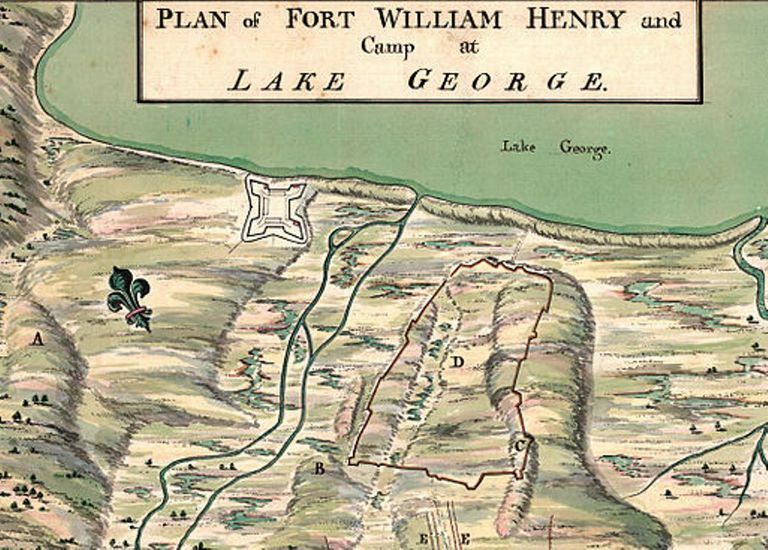 After the immediate fear of the Fort William Henry massacre faded, colonists went back to resisting just about everything Loudoun wanted them to do. Anti-recruitment riots broke out in several colonies during the fall and early winter of 1757. Gen. Loudoun may have thought he caught a break when his former aide, Thomas Pownall became Royal Governor of Massachusetts. You may recall that Pownall had been instrumental in lobbying London to replace Gen. Shirley as Commander of North American Forces. Pownall then returned to America by Loudoun’s side in the summer of 1756. 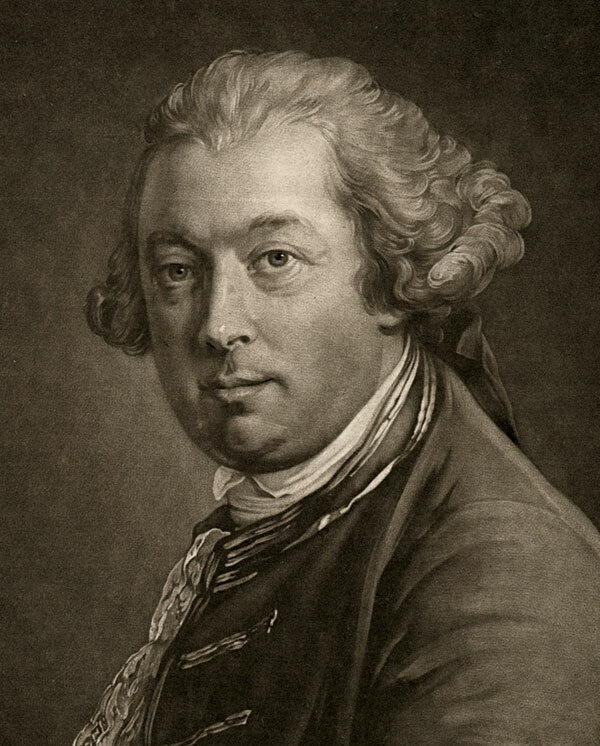 By early 1757 though, Pownall was back in London now badmouthing Gen. Loudoun and angling for a new job. In August, he became Governor of Massachusetts and returned to America. As an astute politician, Pownall quickly realized the Massachusetts legislature was not going to comply with Loudoun’s edicts. Seeing how the political winds were blowing, Pownall decided to back the Massachusetts legislature and oppose Loudoun. Loudoun had hoped to wage a winter campaign against Fort Carillon at Ticonderoga. But with local recruitment failing, he could not get the troops he needed. That, combined with an unusually snowy winter led to an end to the campaign before it started. Loudoun also had to keep some militia beyond the terms of their enlistments. For Loudoun, this was a military necessity, to keep the forts along the New York Frontier properly manned. For the militia, who had volunteered for only a few months after the Fort William Henry Massacre, extending the enlistments for the rest of the winter, especially with no battle apparent on the horizon, seemed like a violation of their rights. Eventually, several of the regiments simply marched home in violation of orders. Technically, Loudoun could have shot them as deserters, but given that the population supported their decision to leave, it would have been politically impossible. One of those deserters was a 19 year old private named Rufus Putnam, a name that will become much more important during the Revolution. In February 1758, Gov. Pownall hosted a conference of New England Governors in Boston, without Loudoun, to discuss how the colonies would respond to the French threat. Outraged that this conference happened without his approval, Loudoun summoned colonial representatives to Hartford to lay down the law and inform them of what he expected of them for the 1758 fighting season. He gave each colony enlistment quotas for militia, though the colonies made clear they might not meet them. Tension between Loudoun and colonial leaders was reaching a breaking point. The political chaos in America was matched by political chaos in Britain. Back in London, the Ministry grew increasingly frustrated with the lack of success in America. Prime Minister Newcastle and Secretary of War Fox had their hands full with an all-out war in Europe. France was threatening German States, including the King’s Hanover. French forces were even building up along the coast, threatening a possible cross-channel invasion of England. The French destroyed a large British fleet in the Mediterranean trying to relieve the British post at Minorca (which also fell). With nothing to show for their efforts, both Fox and Newcastle had resigned from government in late 1756. Despite the failures of Fox and Newcastle, there was no obvious alternative to their leadership. 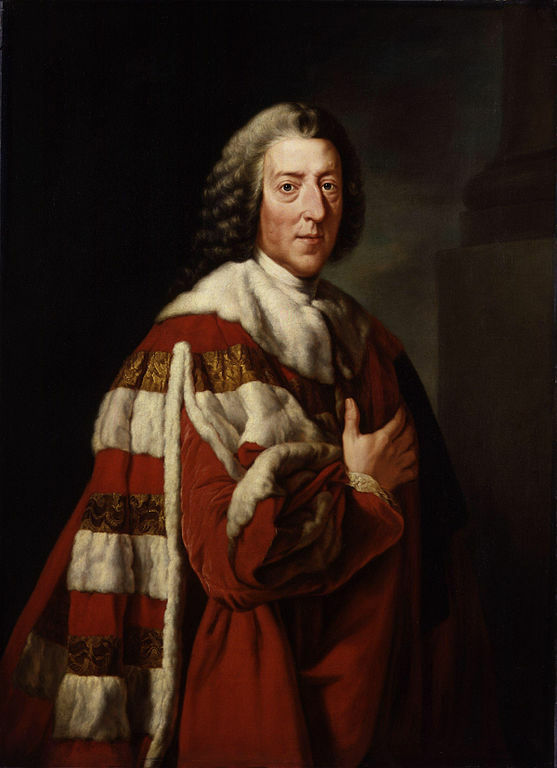 William Pitt, a fellow Whig, had been the main voice of opposition. The King still did not like Pitt much. Pitt’s close relationship with the Prince of Wales remained a sticking point. More than that, Pitt had continually attacked government policies, regularly savaging Newcastle in the House of Commons. Despite all this, the King decided to give Pitt a chance. By putting Pitt in charge of the war effort, I think the King thought either he will do well and Britain will benefit, or he will fail and we can be rid of this pain in the neck. The King decided to put Pitt in charge of the war, but did not want to make him Prime Minister. That position went to William Cavendish, 4th Duke of Devonshire. Don’t worry, you won’t have to remember that name. Although Devonshire served as Prime Minister for about a year, he was pretty much a nonentity. Pitt became the real power in his position as Secretary of State for the Southern Department, which covered matters in the American colonies. Not one for modesty, Pitt commented "My Lord, I am sure I can save this country, and no one else can." 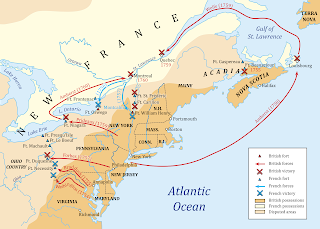 Pitt proposed a massive build up of both the army and navy, enough to protect Hanover for the King, increase the forces in America, and develop a home army to protect against a potential British invasion. Despite his efforts, Pitt never really found favor with the King. After a few months, in April 1757, the King dismissed Pitt, without even finding a replacement. After flailing around for several months of inaction, Pitt and Newcastle were able to make nice with one another. The King appointed Newcastle as Lord of the Treasury and Prime Minister again. Pitt returned to Secretary of the Southern Department again in June. Essentially, Newcastle would control the money and Pitt would control war strategy. Fox ended up getting stuck in a job as paymaster general, with little power but which greatly enriched him personally. He seemed happy with that. Fox’s patron, The Duke of Cumberland, who remember is also the King’s son, headed to Germany to lead an army, planning to come back with greater glory and a restoration of his men to real power. The fortunes of war, however, can be fickle. Facing a superior French force, Cumberland did poorly in Germany. Tasked with defending Hanover for the King, Cumberland was forced to negotiate a surrender that led to his army being disbanded and the surrender of much of Hanover to the French. Upon his return to England, the King remarked: "Here is my son who has ruined me and disgraced himself." Cumberland resigned all of his military and public offices and retired from public life in September 1757. This completely changed the political dynamic in England, giving Pitt much more political capital to fight the war as he saw fit. So, although he had been in the ministry for more than a year, it was not until the fall of 1757 that Pitt really had most of the political impediments out of his way to prosecute the war as he wanted. So most of 1757 was political chaos in London with no unified strategy to fight the war either in America or Europe. By the end of the year though, Pitt had the necessary political support to make real strategic changes that would turn around England’s fortunes of war. A big part of his plan was a renewed emphasis on North America. Next week: William Pitt implements a new plan to win the war, and finds a way to work with the colonies. The History of Canada, Vol. 3, by William Kingsford (1887). General orders of 1757, by Phineas Lyman (1899). The Life of William Pitt, Earl of Chatham, Vol 1, by Basil Williams, (1915). Fort William Henry 1755–57: A battle, two sieges and bloody massacre, by Ian Castle (2013). The Siege of Fort William Henry: A Year on the Northeastern Frontier, by Ben Hughes (2011).